Massachusetts voters are souring on a ballot measure that would limit the numbers of patients assigned to nurses, according to a WBUR poll (topline results, crosstabs) out Wednesday that shows 58 percent of voters now plan to say “no” on Question 1. Earlier polls showed the “yes” camp leading or tied with the “no” side. A “yes” on Question 1 would set new nurse-to-patient ratios: one-on-one care for women in labor, for instance, and a maximum of five psychiatric patients per nurse. There would be caps for other medical situations, too. “If you have to put more nurses into the hospitals to do the job that’s being done now, the effects of that would be increased medical costs,” he said. Bindoo’s aboutface on Question 1 appears to represent the mood of the electorate. The “no” side leads by 27 points in the new WBUR poll and by the same margin in a Boston Globe poll published earlier this week. That’s a big swing since last month, when a WBUR poll showed a dead heat, and a Globe poll had the “yes” camp in front by 19 points. One major development is voters now have a better sense of the price tag. At the time of the earlier surveys, voters had only the wildly different estimates of the opposing sides. The state’s largest nurses’ union, which favors patient quotas, has said Question 1 would cost no more than $47 million per year. Hospitals, which are against the measure, have claimed it would cost about $1 billion per a year. Early this month, an independent watchdog called the Massachusetts Health Policy Commission said the hospitals’ figure is closer to reality. The commission said hospitals would have to hire at least 2,286 additional nurses, altogether. Darlene Tucker, 50, of Hopkinton, has found a simple reason to say “no” on Question 1. “I don’t believe it is somewhere where the government should be sticking their nose in and making the rules,” she said. The “no” side has worked hard to frame the issue as a matter of government interference. But the “yes” side contends the push for mandatory staffing levels comes from nurses themselves. In a WBUR poll a couple of weeks ago, registered nurses supported Question 1 by only a few percentage points. The “no” camp, led by hospitals, has spent $17.6 million so far; the “yes” side has spent $10.4 million. Two other questions are also on the ballot but appear less competitive. Roughly two-thirds of voters plan to say “yes” on Questions 2 and 3. “Yes” on 2 would create a commission with the ambitious goal of finding a way to amend the U.S. Constitution to limit corporate spending on elections. “Yes” on 3 would preserve a state law that prohibits discrimination against transgender people in places of public accommodation — notably, bathrooms. Donna Howard is voting “yes” on that question. She said the two-year-old law has made a positive difference for her transgender son. The WBUR poll has an error margin of 4.4 percentage points. 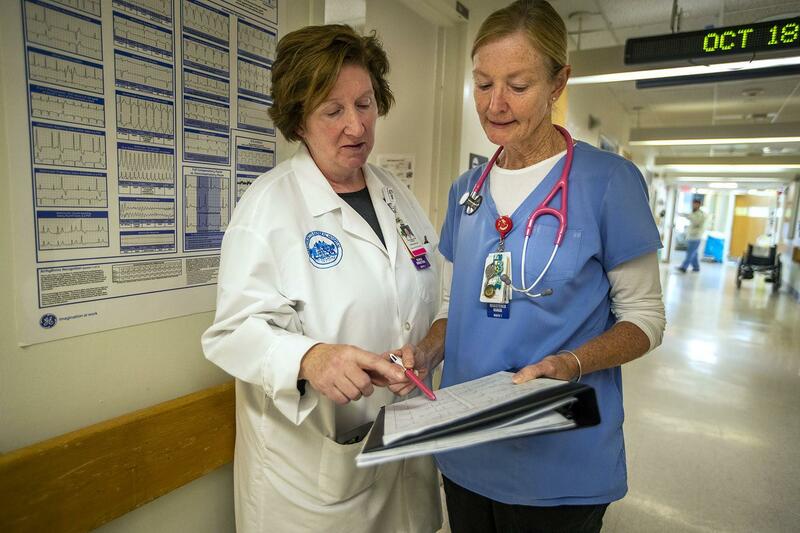 Massachusetts ballot Question 1, if passed, would limit how many patients could be assigned to each registered nurse in Massachusetts hospitals and certain other health care facilities, depending on the unit and the level of care. Brenda Pignone, a staff nurse at Massachusetts General Hospital, arrives before 7 a.m. on a typical day. For 26 years, she’s taken the elevator to a floor known as White 7, where most of her patients are healing after abdominal surgery.